WWE Champion Kofi Kinston spoke to USA Today recently. At one point in the interview, Kingston revealed that he had been bombarded with messages on social media and text after his historic win at WrestleMania over Daniel Bryan. 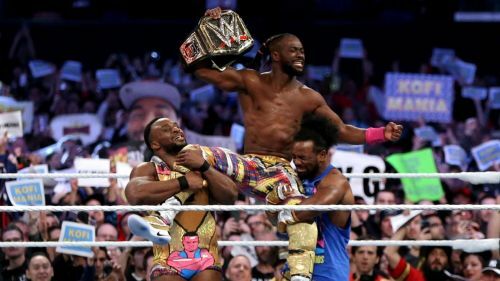 After 11 years of hard-work and entertaining WWE fans, Kofi Kingston finally got a shot at the WWE Championship at WrestleMania 35. Kinston finally achieved his dream and beat Daniel Bryan after hitting him with a 'Trouble In Paradise' and pinning him. "It took me legitimately three days to get through all my phone messages. So I had 150 different texts from 150 different people… Twitter was impossible to even go through and read. I haven't been able to get to the bottom of my timeline because everybody is flooding in with compliments and just good luck messages and things like that. It's been amazing the level of support. I finally, [on Friday], just finished going through the messages on Facebook, but I think I'm all caught up. The problem is that over time you send a message to somebody, they always respond back. It's just awesome to be at the center of all that." "It's equally as important too that people who don't necessarily look like me and can also look to my story for inspiration, because the main thing is I struggled, you know? To get here it's been a long, hard struggle to make it to this point, and anybody out there, whether you're black, white, Asian, South American, whatever, you can look to my story and see I struggled to get here but I kept fighting through." We will find out more about who Kofi Kingston's next challenger will be on SmackDown Live later tonight.